If you’ve ever been to one of our stores, you might have seen our wall of tempered glass screen protectors. But what’s really the difference between tempered and regular glass and why do we always encourage our customers to have a tempered glass screen protector? Well, the difference is right there in the name. When glass is tempered, it undergoes a process to make it more resilient and shatter-resistant. To understand the difference between tempered and regular glass, it helps to understand a bit about tension and compression. Tension is the force an object is under when it is pulled apart and compression is the force that an object is under when it is pushed together. All materials have the ability to withstand a certain amount of both forces before they break, although some materials are better at one versus the other. For example, when you push a spring together, you are putting a compressive force on it, but it retains its shape and strength. When you tug on opposite ends of a rope, you put tensional force on it, but it retains its shape and strength. If you tried pulling a spring apart or pushing on a rope, both would lose its strength. To make tempered glass, pre-cut sheets of glass are heated to crazy high temperatures (around 600 degrees Celsius) and then quickly cooled down with high-pressure air in a process called “quenching”. During the “quenching” process, the outside of the glass is cooled intentionally faster than the underside causing the center of the glass to rise up as it cools. This means that the center of the glass remains in tension, while the outer surface is in compression. You would want the high-traffic center of the glass on your mobile devices to be in compression because glass in tension is 5x more likely to break than glass in compression. Quenching is not the only process that manufacturers use to create tempered glass, but it is the more popular because it’s less expensive. The other method involves soaking sheets of glass in potassium ion baths resulting in an ion exchange. This is the method that Corning uses to make their incredibly popular Gorilla Glass. 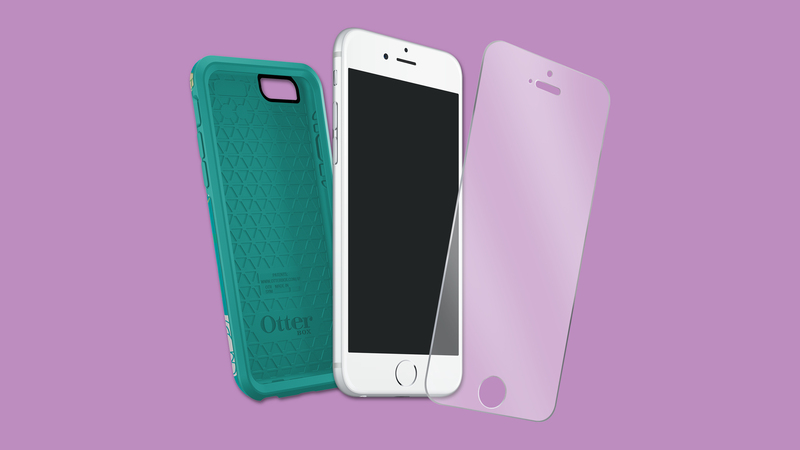 So now you know how it’s made, but why should you spend your money on tempered glass? Well, it’s called toughened glass for a reason, it’s physically and thermally stronger than regular glass. It’s used for things like smartphone screen protectors, windows, and windshields because it’s strong and can withstand more than regular glass. It is also designed to crack into small pieces rather than shatter in large, sharp and dangerous shards. The bottom line is protection and prevention. Protecting your phone with good-quality tempered glass ensures that if you drop it, you’re much less likely to need a repair. Our uBreakiFix Screen Protector is made with Tempered Glass because we don’t think you should risk your expensive device by putting a weak screen protector on it. While we’re always happy to fix your screen for you if it cracks, we know you’d rather not have to go through the hassle and headache that comes with dealing with a broken phone. If you’re interested in protecting your device with premium tempered glass, come into any ubreakiFix location and ask a technician about uBreakiFix Premium Tempered Glass.